● CREATE THE PERFECT ATMOSPHERE - Our brilliant warm white flickering lights contain 105 LEDs with 2835 high power SMD bead chips and 3 modes to meet your lighting desires. Choose between "Flame Emulation - Flickering", "General" & "Breathing" modes to bring the full fire effect in the comfort of your home or business. ● EXPERIENCE A NATURAL FLAME WITHOUT THE HEAT - Our LED lights dissipate the heat evenly through carefully designed holes in the head and base of the lamp. This means you can enjoy 50,000 hours of imitation camping, romantic evenings inside or night lights without having to worry about overheating. ● EASE TO USE - Simply screw our flame bulb into any E26 socket, sit back, relax and enjoy as the 10W light ignites for instant color and pleasure in your home. Perfect for lanterns, kitchens, dining rooms, bedrooms, kids' rooms, outhouses or any other sheltered outdoor spaces. ● DURABLE AND SAFE - Our products have a tough, robust, hardwearing polycarbonate shell so there's little risk in breaking them. There's no glass here, so you can feel safe transporting these lights around your home for a noticeable improvement and vivid fire effect in any room. CREATE THE PERFECT ATMOSPHERE - Our brilliant warm white flickering lights contain 105 LEDs with 2835 high power SMD bead chips and 3 modes to meet your lighting desires. Choose between "Flame Emulation - Flickering", "General" & "Breathing" modes to bring the full fire effect in the comfort of your home or business. EXPERIENCE A NATURAL FLAME WITHOUT THE HEAT - Our LED lights dissipate the heat evenly through carefully designed holes in the head and base of the lamp. This means you can enjoy 50,000 hours of imitation camping, romantic evenings inside or night lights without having to worry about overheating. EASE TO USE - Simply screw our flame bulb into any E26 socket, sit back, relax and enjoy as the 10W light ignites for instant color and pleasure in your home. Perfect for lanterns, kitchens, dining rooms, bedrooms, kids' rooms, outhouses or any other sheltered outdoor spaces. DURABLE AND SAFE - Our products have a tough, robust, hardwearing polycarbonate shell so there's little risk in breaking them. There's no glass here, so you can feel safe transporting these lights around your home for a noticeable improvement and vivid fire effect in any room. GET ME QUICKLY - We use Amazon FBA so order now and get me in only a few days. 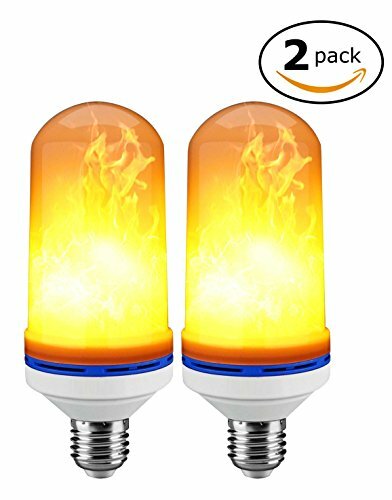 Add to Cart now and experience a new LED flame sensation delivered to you by Amazon Prime! If you have any questions about this product by S.A.Pro, contact us by completing and submitting the form below. If you are looking for a specif part number, please include it with your message.